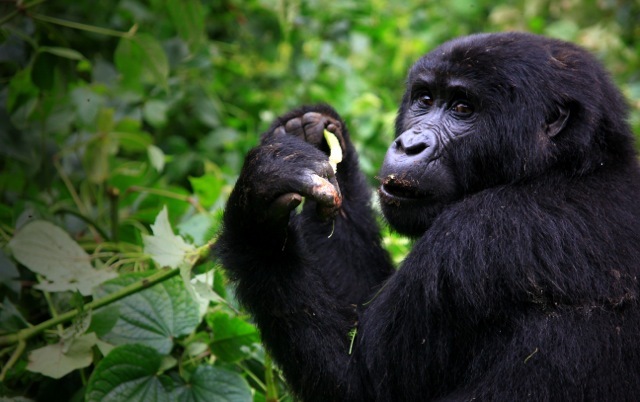 Gorilla trekking is the highest-rated tourist activity in Uganda. People don’t mind trekking for 2-6 hours just to have an hour encounter with these fascinating creatures. Would you? The dense forests and humid climate of Uganda make the perfect hospitable biome for more than half of the world’s population of endangered mountain gorillas; a great majority of which live in Bwindi Impenetrable National Park. If you plan on visiting Uganda, then a gorilla trek should be at the tippy-top of your to-do list. Here’s quick guide to gorilla trekking in Uganda, providing all the information you need to make your gorilla trekking experience a memorable one. Read on! Mountain gorillas are a subspecies of gorillas known as Gorilla beringei beringei. Unlike the lowland gorillas of West Africa, Mountain gorillas are not as common. They can only be found in the wilderness of Rwanda, the national parks in Uganda, and the Virunga National Park in the Democratic Republic of Congo. There are fewer than 800 Mountain Gorillas left in the world. Let that settle in. Mountain gorillas were hunted and poached to near extinction for their skin, meat, and bones, leading up to the establishment of conservation parks aiming to protect these critically endangered creatures. For a long time, no one was allowed to visit the gorillas. But in recent times the Bwindi Impenetrable National Park and Mgahinga National Park were opened to the public. Fortunately, the population of mountain gorillas is steadily growing with time, but trekking is monitored very closely and only a few hundred people are permitted to visit the gorillas on any given day. Be sure to secure your reservation on a trek in advance! Where are Mountain Gorillas Located in Uganda? Between Mgahinga and Bwindi Impenetrable National parks there are about 11 mountain gorilla families. Mgahinga Park experienced an inconsistent gorilla presence as they moved around, so most trekking permits are sold at Bwindi. Many years ago a gorilla permit sold for $450, but now they go for $600. It is even projected that the permits may go up to $1,000 in the next few years to minimize the number of daily tourists as human invasion of their territories is what led to their critically endangered status in the first place. How do you get a Gorilla Permit? It is becoming increasingly difficult to get a gorilla permit. As much as 72 people a day apply for gorilla permits. As little as 8 are accepted, so as not to disturb the gorillas. Permits are sold by Uganda Wildlife Authority and cost as much as $600. It’s advisable to book a permit ahead of time to increase your chances of going on a gorilla trek. Remember to book a gorilla family closest to your safari accommodation to reduce long unnecessary treks in the humid tropical climate. When should you go for a Gorilla Trek? The humid weather in Uganda is fairly constant. This means that gorilla trekking occurs year-round. However, tourists prefer trekking from June-September and from December – February. Gorillas begin their day as early as 6am, with many naps during the day. Their day typically ends by 6pm as night sets in. Gorilla families are very mobile, moving to different locations during the day, and resting at night in nests made from twigs and leaves. They usually stay on the ground, but may swing on trees from time to time. What do you Wear for a Gorilla Trek? Gorilla treks take as long as 2-6 hours, which can be exhausting. It is advisable to start off early to avoid the mid-day sun. Thick hiking boots are advisable to protect the feet. Face caps, wide brim hats, and sunglasses give good eye protection. Remember that the temperature gets cooler at high altitudes. It is, therefore, advisable to pack layered clothing to keep warm. Pack bottled water to prevent dehydration from excessive sun and wind exposure. Always take your garbage with you and remember: “Leave no Trace.” Also remember, ‘less than 800’ (mountain gorillas left in the world). Prices of safari lodges vary according to size, luxury, location, and facilities. Prices range anywhere from $70-$900. Remember to book gorilla families closest to your safari lodges. Bwindi National Park is a remote area with tricky terrain. For tourists, these terrains can even be trickier to trek. Although safari tours are a bit on the expensive side (an estimated $1,000), booking the services of a safari guide helps you save money in the end. The safari guides are trained to track and follow gorillas, and should the need arise, protect you from aggrieved gorillas. 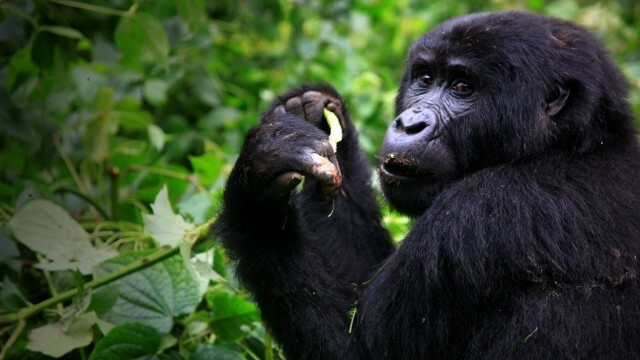 The mountain gorillas in Bwindi Impenetrable National Park are habituated to humans. Undisturbed, these gorillas are gentle and shy. Mountain gorillas are herbivores, feeding on large quantities of flowers, leaves, fruit, roots, bamboo, and shoots when they’re in season. We should be mindful of the massive size of these creatures. Adult male gorillas grow to about 6 feet tall and weigh an average of 350 pounds. Mountain gorillas have strong muscular arms. When provoked, these creatures can crush anything with their powerful hands to protect their territory and family. Handling of their young, sudden movements, and even giving out food are strongly discouraged. It is advisable to hire the services of a safari guide and pay attention to instructions from the guide.